St Augustine or the blessed Augustine is a philosopher who studied widely about Christianity. He wrote a lot about Christianity, which was a major reason for the development of western Christianity. Later he evolved his own approach towards philosophy. His teachings were mainly based on salvation and the divine presence and his grace on the entire human race. Owning to his contribution to Christianity, he was bestowed with the title Doctor of the Church. "Since Love Grows Within You So Beauty Grows For Love Is The Beauty Of The Soul"
What can a saint convey us through his quotes? Good and valuable things which make our life more meaningful. There are people who are stunningly beautiful. But have you ever thought that we all are unthinkably beautiful inside? Everyone loves someone or the other. When love grows the beauty of the soul grows twofold. Love makes people beautiful. 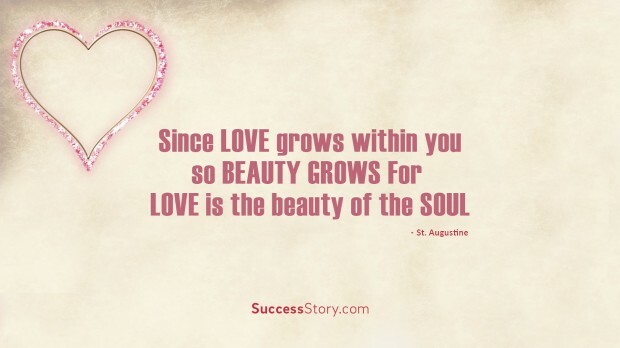 The best proof for this is depicted in ST. Augustine's quote in which he says the beauty of the soul increases with the depth and sincerity of love you hold for others. We don't have the power to predict our future. What we do is to try hard and leave the rest to God. It is true that the good Good God loves those who work hard. St Augustine says that when we work hard, we should work as if everything depends on us and we are the only person responsible for the outcome. But mere hard work is nothing without the magic touch of God. Pray for him thinking that he is the only savior who can take us to a greater height. In short, effort without God is nothing. Similarly, in order to obtain beatitude we have to sweat and be involved in what we are doing.